Gary Bertwistle has been working in the area of creativity and innovation for over 20 years, spanning the retail, music and radio industries. In 1997 Gary studied creative problem solving in New York and in the years following, he has shared his vast knowledge and experience with both organizations and individuals, exploring the opportunities that exist within our minds to unlock our great ideas. 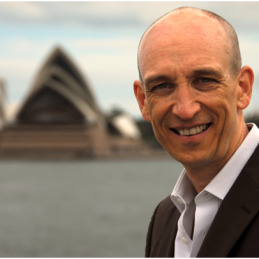 In 2002 Gary opened Australia’s first ever creative thinking venue at Fox Studios in Sydney called the Ideas Vault. His venue is now used by some of the biggest corporations in the country for creative thinking, meetings, seminars and training sessions. Gary is also the co-founder of Australia’s leading cycling foundation the Tour de Cure which raises money in an effort to cure cancer. The Tour de Cure has now raised four million dollars in donations and many millions of dollars in publicity since its inception in 2007. Along with the cycling foundation Gary has founded a corporate fund-raising day called the Day of Inspiration which gathers together keynote speakers, entertainers and performers at the Four Seasons Hotel in Sydney for a one day event in front of a corporate crowd to raise awareness and funds towards the curing of cancer. Gary won the Speaker of The Year Award Winner for TEC (The Executive Connection) in both 2007, 2008 and again in 2012. Gary has also released 6books: The Keys to Creativity (2006), Who Stole My Mojo (2008), What Made You Think of That? (2009), The Vibe (2010), My Dad’s Got Mojo (2010) and What I Wish I Knew About Cancer (2011).